Совместный релиз Satanath Records с Cimmerian Shade Recordings и Murdher Records: новый альбом "Golden Serpent God" американской blackened mesopotamian folk/death metal группы Akhenaten выходит 31 мая! / Co-release Satanath Records with Cimmerian Shade Recordings and Murdher Records: new album "Golden Serpent God" of US blackened mesopotamian folk/death metal band Akhenaten is out on May 31st, 2018! Akhenaten представляет новый альбом «Golden Serpent God». В обширном гобелене человеческого опыта, сплетённом в сказках о древних божествах, найдена сфера эмпирической мудрости. Погружённые в мифологию и мистику Древнего Египта и Месопотамии, братья Houseman из США исследуют забытые пути истории, извлекают неизвестные знания и нити истины. Из этого путешествия появился студийный проект «Akhenaten», который параллелен темам, затронутым их основной группой Helleborus. Подобно дебютному альбому «Incantations Through the Gates of Irkalla» новая работа погружает нас в атмосферу древнего мира. Эпический звуковой ландшафт экзотических, чудовищных видений и неуловимых мелодий, которые преследуют наполовину запомнившийся сон. Разноцветный звук группы основан на blackened death metal, наполненном экзотическими инструментами и ритмическими структурами древнего Ближнего и Среднего Востока. Для фанатов Al-Namrood, Narjahanam, Melechesh и Kartikeya. 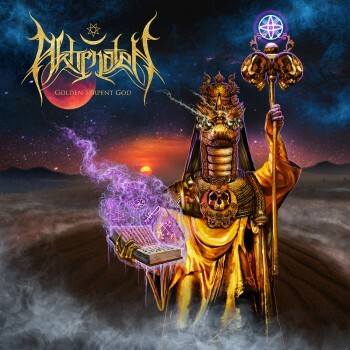 Akhenaten presents new album "Golden Serpent God". Above the sphere of experiential wisdom found in a vast tapestry of human experience woven in the tales of ancient Deities. Steeped in the mythology and mysticism of ancient Egypt and Mesopotamia, the Houseman brothers from USA explore forgotten paths of history, extracting unknown lore and threads of truth. Out of this journey emerged the studio project "Akhenaten", which parallels themes found in their main band Helleborus. Similar to the debut "Incantations Through the Gates of Irkalla” band draw on the diverse wisdom and sound of the ancient world. Epic soundscape of exotic, monstrous visions and elusive melodies that haunt like a half-remembered dream. Akhenaten's flourishing sound is rooted in blackened death metal, suffused with the exotic instrumentation and rhythmic structures of the ancient Near and Middle East. Sharing the exclusive characteristics of bands such as Al-Namrood, Narjahanam, Melechesh and Kartikeya, band whispers to the most remote regions of primal memory. All lyrics, music recorded and produced by Jerred Houseman in Manitou Springs, Colorado, USA. All vocals performed by Wyatt Houseman. Gutaris on God Of Creation written and performed by Brian Palmer. Layout by Wyatt Houseman of Hidden Hand Extreme Music Marketing. Cover artwork by Tony Koehl of Sketch The Soul. Title page artwork illustrated by Dennis Lee Hughes of Cythraul Art.